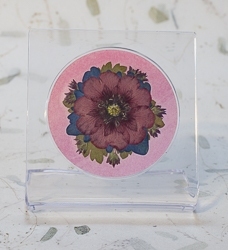 Handmade, 100% real flower curio picture features red potentilla, blue hydrangea petals and oregano florets. Makes an everlasting keepsake or special gift. Flowers are mounted on an acrylic easel display and have been covered for protection. The flower arrangement area is 2 1/4" diameter, and the easel is approx. 2 7/8" wide by 3" tall by 1 3/4" deep. Includes separate information slip about what flowers are included and what makes this so special. One-of-a-kind, what you see is what you get. Note: Available in quantity of one.